조선 중기 명곡(明谷) 오희도가 자연을 벗 삼아 살던 곳으로 그의 아들 오이정이 선친의 뒤를 이어 이곳에 은둔하면서 자연경관이 좋은 도장곡에 정자를 짓고, 앞뒤로 네모난 연못을 파서 주변에 적송, 배롱나무 등을 심어 가꾼 정원이다. 시냇물이 흘러 한 연못을 채우고 다시 그 물이 아래의 연못으로 흘러가는데 물 흐르는 소리가 옥이 부딪히는 것만 같다고 하여 연못 앞에 세워진 정자 이름을 명옥헌(鳴玉軒)이라고 한다. 주위의 산수 경관이 연못에 비치는 모습을 명옥헌에서 내려다보며 경관을 즐길 수 있도록 조성하여 자연에 순응한 조상들의 지혜를 잘 반영한 전통원림으로 자연경관이 뛰어난 경승지이다. 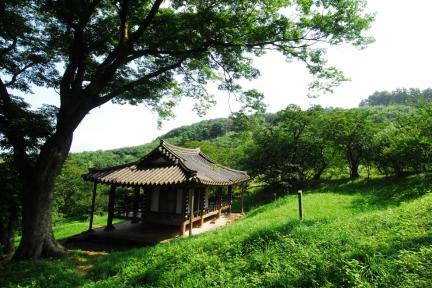 During the mid-Joseon Dynasty, O I-jeong inherited the house at which Myeongokheon Garden is situated from his father. He had a pavilion built in a nearby valley, and completed the garden with two rectangular ponds, red pines, and grape myrtles. 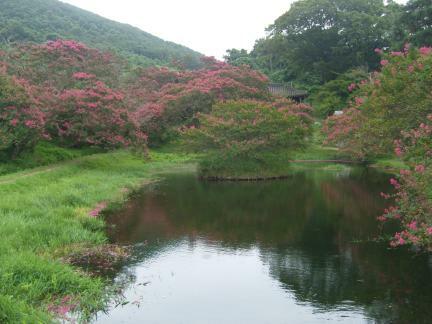 The sound of the running stream was compared to that of tinkling jewels, thus giving rise to the fittingly named Myeongokheon House (literally meaning “the house of tinkling jewels”). A person seated in the pavilion can enjoy the view of the natural surroundings reflected in the water of the ponds.